Mention the name Parthenon Huxley or P. Hux to folks in the ELO (and related artists) community and not a few will identify him as the lead guitarist and vocalist with The Orchestra Starring Former Members. Yet Hux has many strings to his bow, if you'll excuse the pun, with a wealth of quality albums of his own behind him including the acclaimed "Homemade Spaceship" and "Kiss The Monster", not forgetting he contributed the excellent ELOesque anthem "Jewel & Johnny" to The Orchestra's only studio outing to date, 2001's "No Rewind". 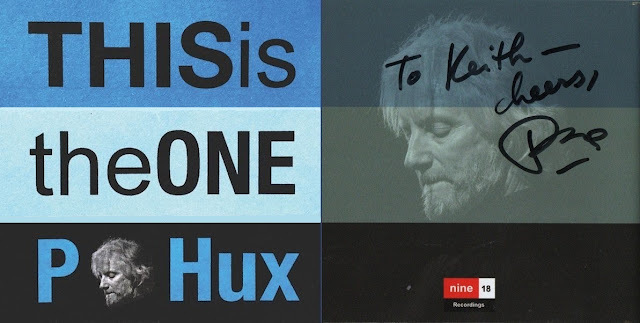 Cue "This Is The One" (nine 18 Recordings), the new album from P. Hux released last month, a thoroughly enjoyable eleven (11) song outing demonstrating not only some top class songwriting but also "recorded in living stereo" with a tight band giving it a organic, atmospheric feel. Whilst there are deft violins and cellos in here that fans of the ELO sound will surely appreciate, this is most certainly a record that comes under the Power Pop banner with nods to The Cars ("Just Sayin'"), America ("Off We Go"), The Beatles ("Inside Your Shoes") and Tom Petty ("Song For James" ) amongst not a few others. elobeatlesforever (elobf) recommends "This Is The One" by P. Hux to those enlightened folks who enjoy the music of ELO, Jeff Lynne, Roy Wood, The Move, The Idle Race, 'Brum Beat', The Beatles and related artistes.